There is no happier time to visit the city of Chicago than spring. Moving to the Midwest this time of year? Making a new home in Chicago? Flower buds burst from the trees in nearby parks, colorful gardens appear along the streets and locals flock to festivals, concerts and anywhere that allows them to spend time outdoors in the newly emerged warm weather. And with unpredictable weather conditions year-round, there are also plenty of indoor options to choose from in Chicago. Plus, as an added bonus: most of these events are free! On April 17, celebrate Earth Day with those around the world as you help the Chicago Park District clean up parks around the city. You will also experience environmental education, nature walks, festivals, crafts and more! From 9:30 a.m. to 12 p.m., help clean up Loyola Park! On April 23, head to Gage Park at 6:30 p.m. for a free show by the Chicago Symphony Orchestra! This is a rare opportunity to enjoy the sounds of this renowned orchestra at an affordable price for all. 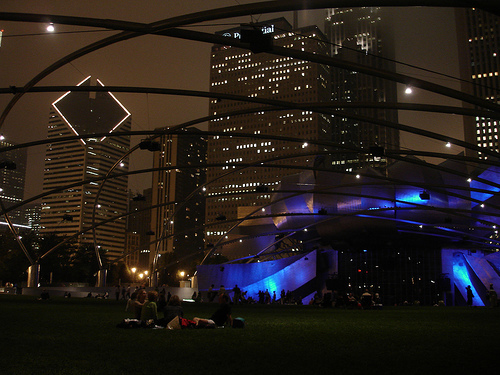 On May 8 and 9, visit Millennium Park for the 14th Annual Celtic Fest Chicago! Performers and artists bring the Celtic culture to life with music and dance, art exhibits, authentic food and beverages, and more! On May 15, visit Kilbourn Park & Organic Greenhouse for their annual event from 10 a.m. to 3 p.m. Learn more about open-pollinated tomatoes suitable to grow and eat in Chicago, along with seasonal organic vegetables, herbs and flowers. You’ll be well on your way to being a local, organic gardener! From May 21 through May 23, attend the 15th Annual Chicago Mayfest in Lakeview. As usual, this German-inspired festival includes an array of beers, food and live music. Feel free to show off your pets at this pet-friendly event too! On May 29, celebrate Memorial Day with the rest of Chicago at the annual Memorial Day Parade. A wreath is laid at the Eternal Flame on Daley Plaza, and the parade will proceed down State Street, starting at Randolph Street. Support past and present military men and women who have risked or are risking their lives everyday for our freedom. On May 30, enjoy a casual bike ride down the middle of Lake Shore Drive! Bike the Drive costs $32 to $42 to register and runs from 5:30 a.m. to 9:45 a.m. After the 15 to 30-mile ride, with rest stops and snacks along the trail, head to Butler Field in Grant Park for live music and a pancake breakfast from 8 a.m. to noon. Celebrate the renewal of baseball season in Chicago! Plan to cheer on the Chicago Cubs at Wrigley Field at home games now through April 18, April 26 through April 30, May 1 and 2, May 10 through May 18, and May 25 through May 30. Visit U.S. Cellular Field to cheer on the Chicago White Sox at home games on April 20 through April 25, May 3 through May 9, and May 19 through May 23. Enjoy a free day at any one of Chicago’s notorious museums! All of the museums offer select dates where admission is free. Visit the Adler Planetarium on April 20 or 27, or May 4, 11, 12, 18 and 25. Visit the Art Institute of Chicago on any Thursday from 5 to 8 p.m. until Memorial Day. Visit the Museum of Science & Industry on April 19 through April 23, or May 3. For more listings on free admissions days, click here. *Billy Elliot the Musical at Ford Center/Oriental Theatre, began March 18. *The 39 Steps at Bank of America Theatre from May 19 through May 30. *Fuerza Bruta at Auditorium Theatre beginning May 21. With so many things to choose from, there’s no better time to visit Chicago than this spring! And if you’re looking to make the Windy City your new home, check out for-sale properties here!